On a recent visit to my husband’s hometown, we visited his aunt and uncle who live across the street from his parents. Auntie Jackie is one of those home cooks I greatly admire. She can decipher recipes from taste, has a discriminating palate rooted in Japanese cuisine, and is incredibly confident in the kitchen. All this, of course, comes from cooking countless meals over decades. It’s always a huge treat to taste something she cooks, whether it be a slab of apple pie or nishime. This time she made an incredible cioppino. Since I do all the cooking at home, I can’t say what a treat it was to have such a delicious meal cooked for me! While the cioppino was the star of the meal, there was a bowl of roasted green bell peppers to the side. I could eat those peppers for days. They were soft and sweet the way roasted peppers are, but had an incredible flavor that I can only describe as Japanese. My palate isn’t discerning enough to tease out the individual ingredients. All I know is those peppers and a bowl of rice will make me plenty happy. Those peppers reminded me of a recipe I’ve been meaning to try: deep fried vegetables in mentsuyu. Mentsuyu is the broth used to dip noodles (men means noodles, tsuyu means sauce or soup), but it was used in that recipe to marinate the vegetables. The deep frying stopped me from trying this earlier, but using Auntie Jackie’s technique of roasting bell peppers sounded the perfect way to navigate around an oily hot mess. 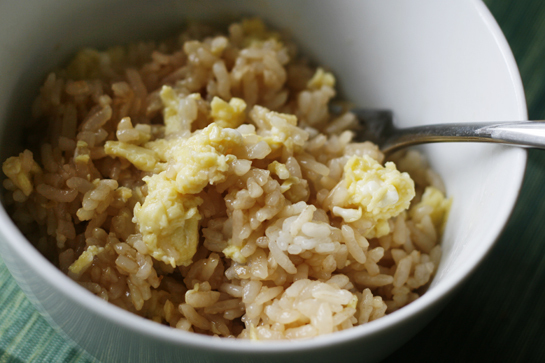 This recipe makes more mentsuyu than you’ll need, so here’s another idea: make scrambled eggs and fry some rice with a couple of tablespoons of this mentsuyu. I’ve been making this for a quick after school snack for my stepdaughter and she loves it. You could also use it for tendon or other donburi dishes. Or, use it for soba, as it is intended! 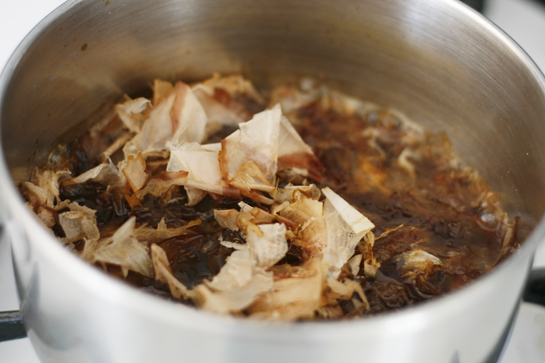 Make the mentsuyu by putting the water, shoyu, mirin, and sugar into a small pot over medium heat. Whisk to dissolve sugar. Just before it begins to boil, add the katsuobushi and turn to low. Simmer for 3 mins. Set aside to cool for 15 mins, then strain. Roast the peppers, let steam, and skin while still warm (There’s a great video on how to roast peppers here). Cut into strips and place in a bowl. Add 1/2 cup of mentsuyu and 2 Tbsp olive oil and let sit. This will keep in the refrigerator for 2 to 3 days. 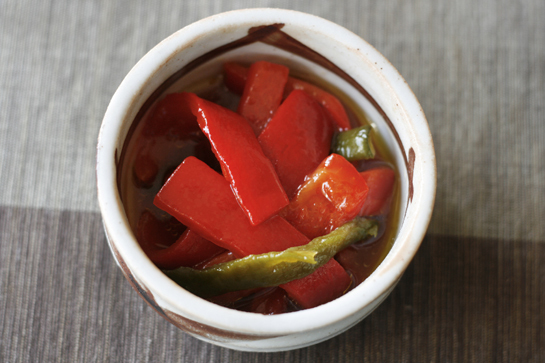 The peppers can be eaten cold or at room temperature. This entry was posted in Contemporary Recipes, Favorites, Vegetables and tagged bonito flakes, jalapeno, katsuobushi, mirin, red pepper, shoyu, soy sauce, sugar. Bookmark the permalink. Post a comment or leave a trackback: Trackback URL. I am running tomorrow to see if my favourite red, long Hungarian peppers are still available! 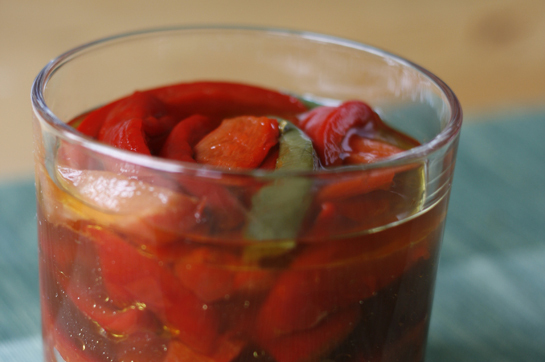 I don’t know why, but your peppers reminded me of the ones I have been pickling in sweetened vinegar for years. They are not skinned, but become sweet and mellow and irresistible. I must absolutely try these peppers in mentsuyu. It sounds like pickled peppers but without vinegar. Wonderful! Sissi! I hope you like this recipe as much as I do. I think the mentsuyu compliments the natural flavors of the peppers—let me know how it works out! OMG these look and sound SO GOOD!!! I need to learn to roast peppers (and will definitely make the mentsuyu for fried rice as you suggested)!! N, mentsuyu is so versatile! I really should freeze some so I always have it ready to go. Hope you enjoy the recipe!